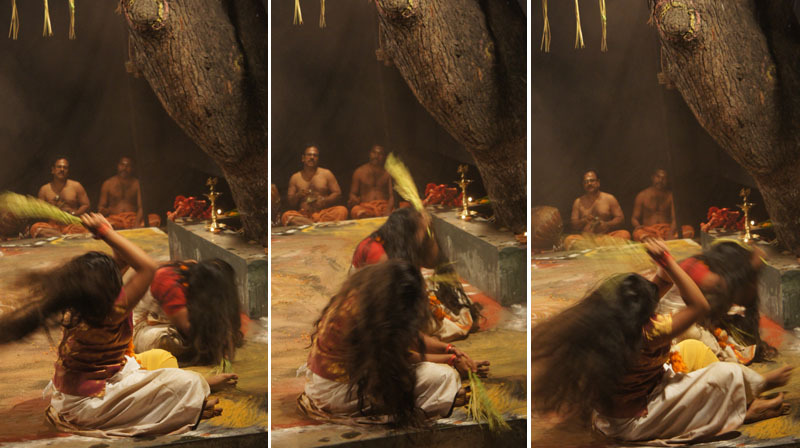 One week long sweet and powerful immersion in an extremely interesting aspect of Kerala’s culture. 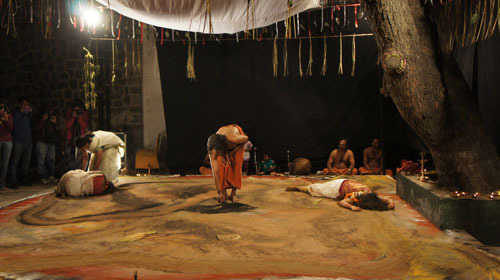 I knew Kalamezhuthu from various articles and many videos and a very interesting documentary produced by the Indira Gandhi national Centre for Arts, but the real meeting with this multifaceted art was a unique experience. 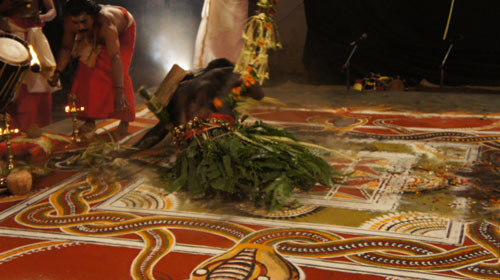 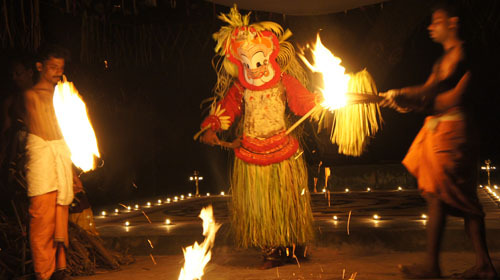 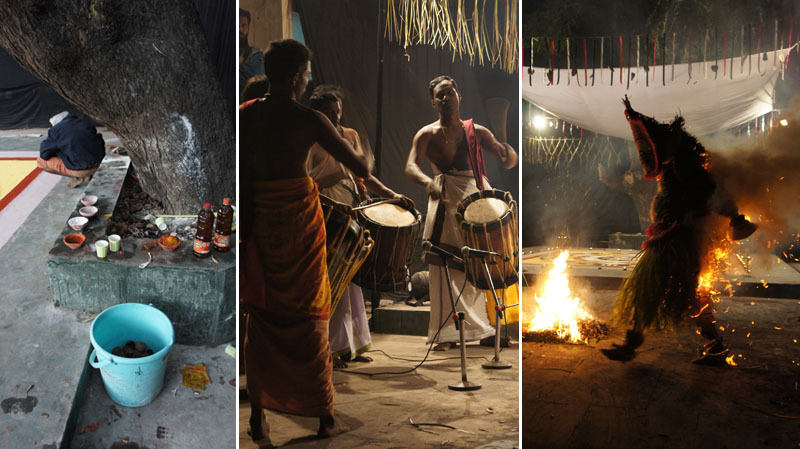 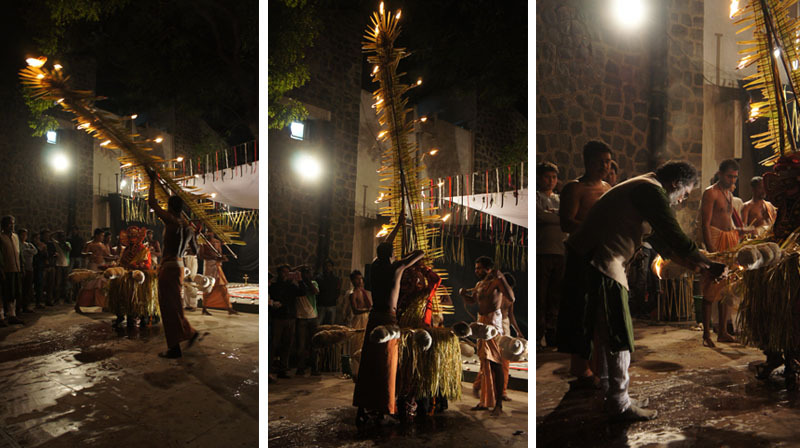 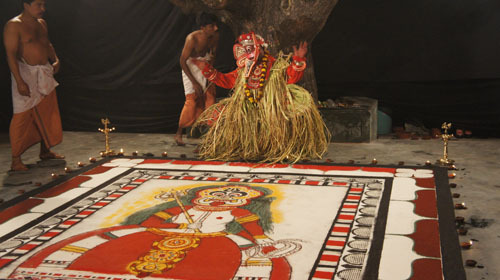 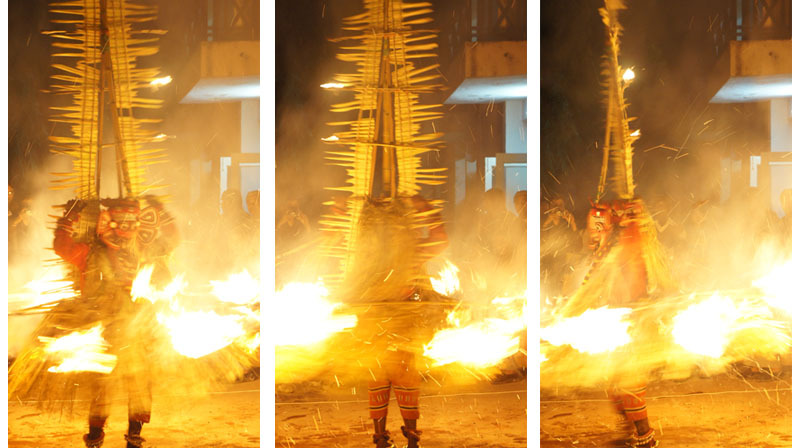 It is a ritual including visual arts, music, dance, masks making, body painting, fire controlling techniques, Ayurveda, trance. 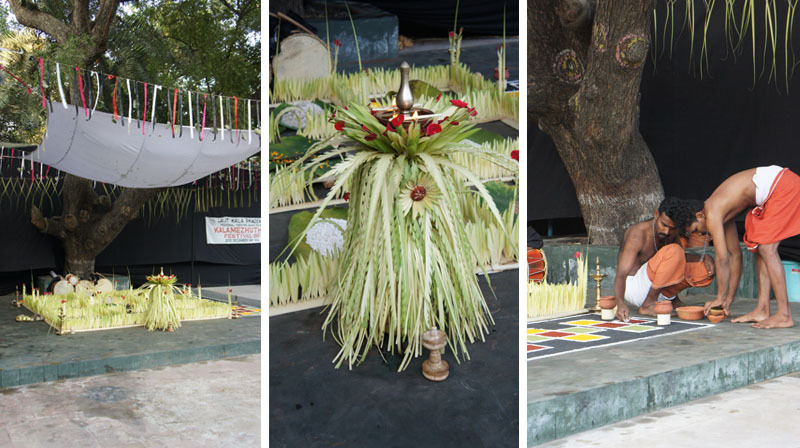 As Sathyapal, regional secretary of the Lalit kala Academy and organizer of the Kalamezuthu Festival explained, those Kalams presented at New Delhi were just a very small portion of a vast number. 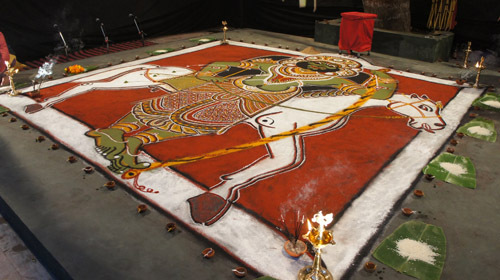 Sathyapal is an expert of tribal art and culture and has edited various books on this subject, one of them Kalamezhuthu. 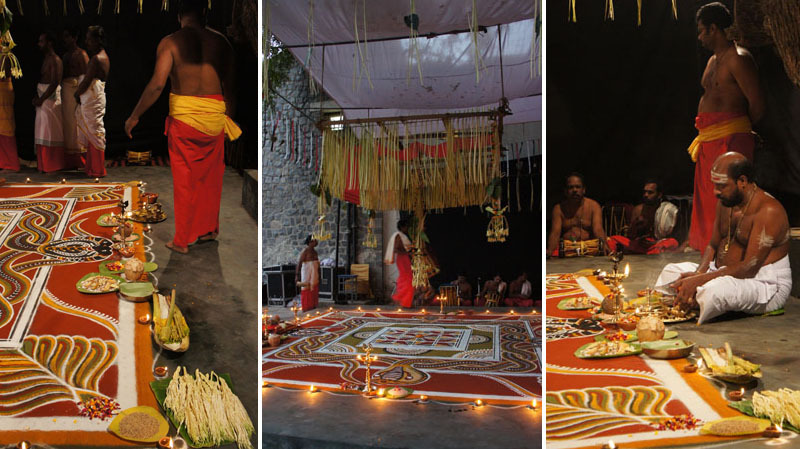 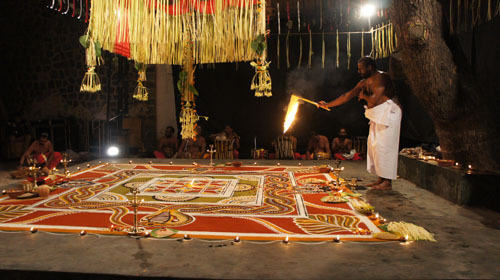 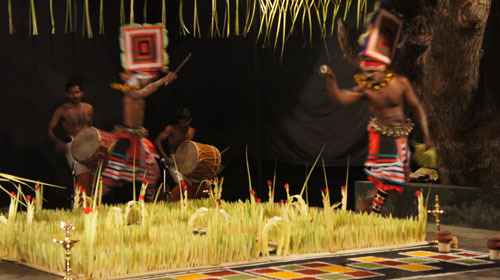 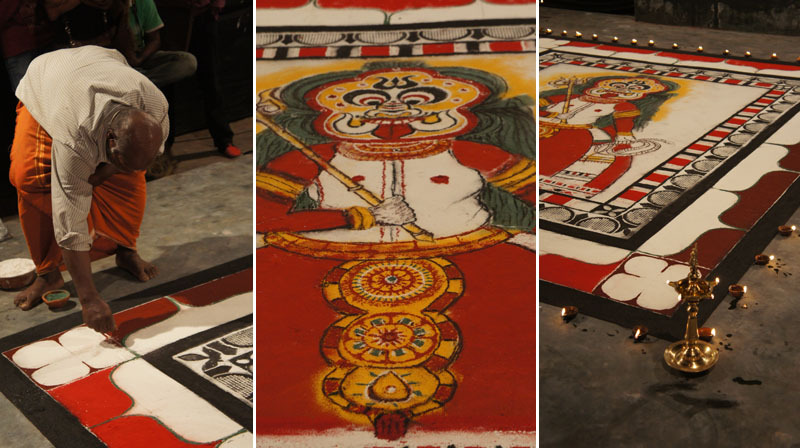 Ritual Art Practice of Kerala, is entirely devoted to Kalams, I will present that wonderful book in the next post. 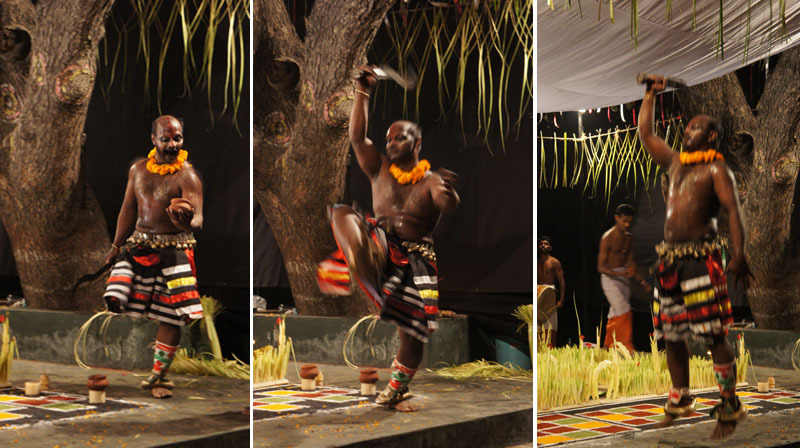 Every evening each group’s performance was introduced and explained in its peculiarities by Dr. K.G. 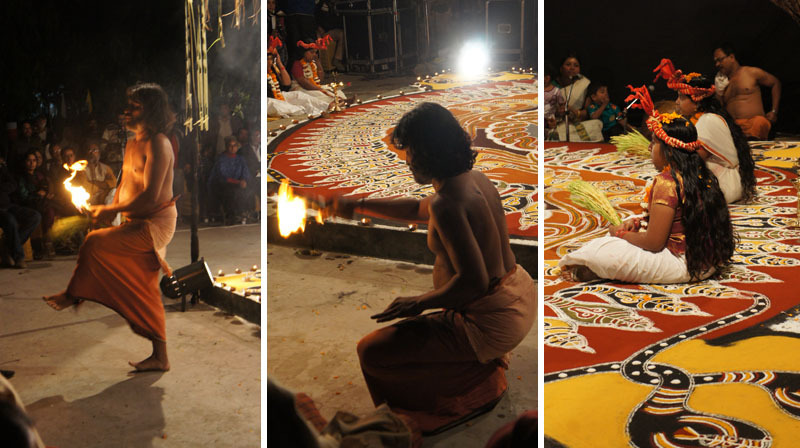 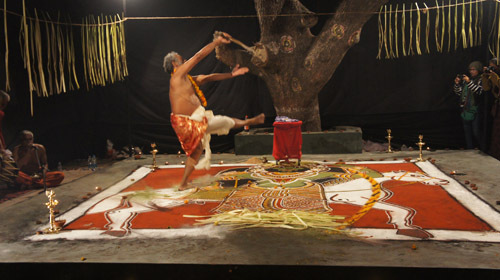 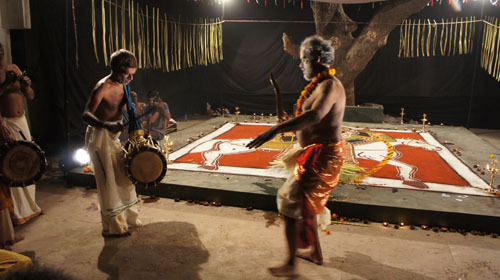 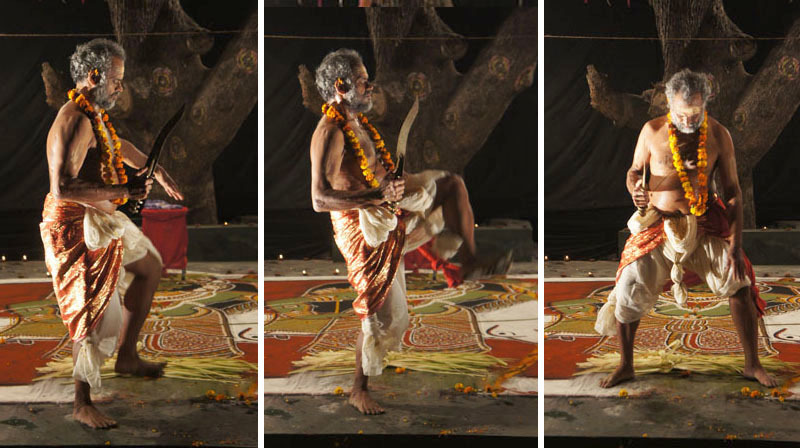 Paulose, renowned scholar of Kudiyattam and Kerala culture https://sutraartiperformative.com/2013/12/28/performing-arts-of-kerala/. 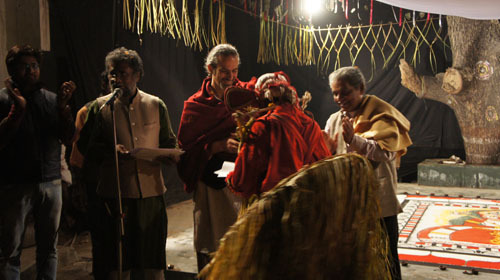 His contribution was helpful because furnished, in clear and simple words, the crucial elements of each Kalam and introduced to their symbolical aspects and values.Not only Kalams were beautiful and the ritual extremely interesting, but even the atmosphere at Garhi was peaceful and inspiring, thus, after three days spent there I became part of the community and I was invited to felicitate the performers. 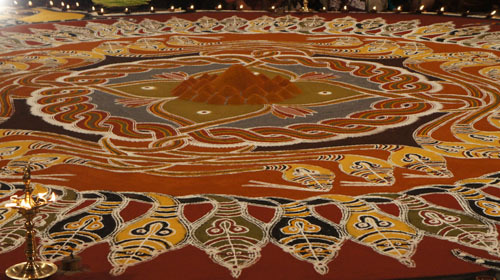 The making of a Kalam, the image drawn with colored powders over a geometrical pattern, is a long process lasting many hours. 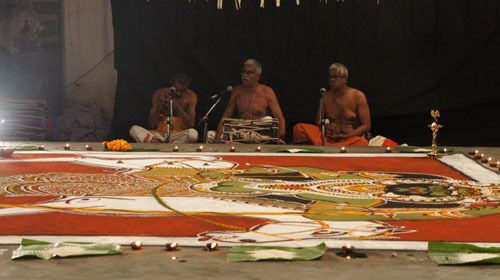 Once that the image is complete it has to be enlivened by music, Kalam Pattu. 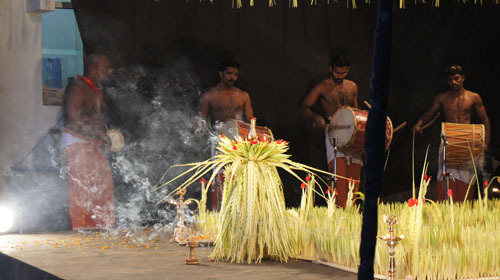 Drums of many kinds and shapes are the main instruments of the Kalamezhuthu and the most common among them are the chendas, cylindrical drums usually played with sticks. 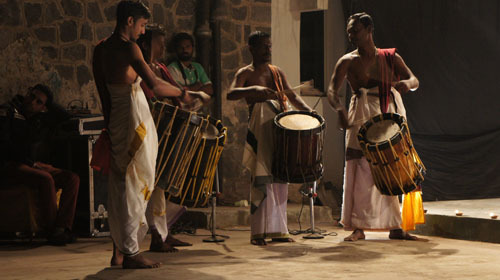 The fourth day of the festival Panayoor Vasudevan Party played an ensemble of barrel drums producing a beautiful thundering and powerful sound, while Sudheer Mulloorkara & Party played the Pulluvan Kutam, a unique instrument – consisting of a pot, a string and a bamboo tube – producing a buzzing sound. 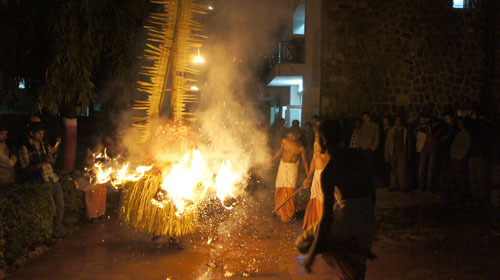 It is a typical instrument of the Pulluvans, a caste of Kerala associated with serpent worship. 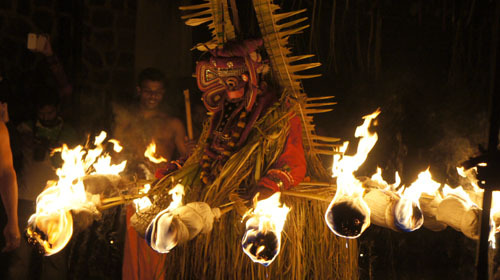 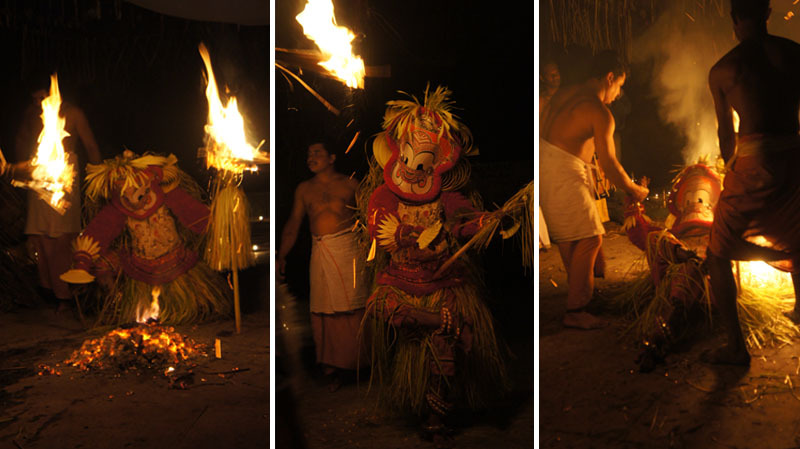 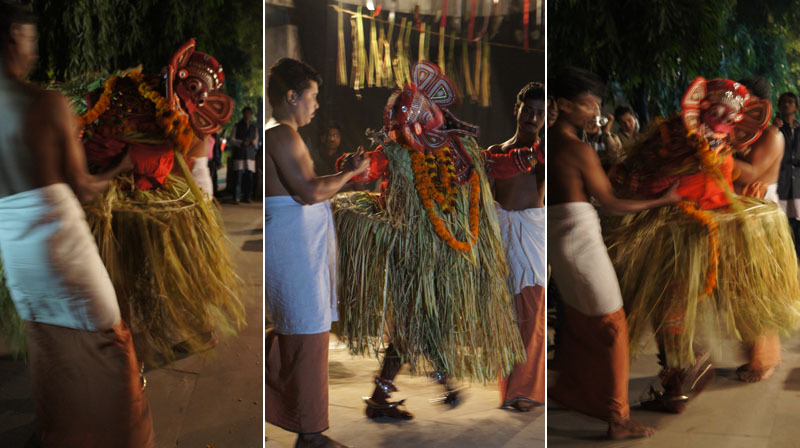 Some Kalams include the presence of a performer, properly dressed and wearing a mask, enacting a particular god of hero (Theyyam). 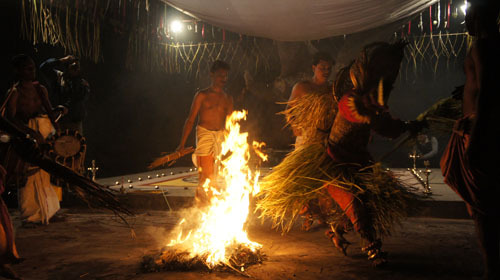 Sunil Panikar & Party presented Agni Gulikan Theiyyam and Pottan Theiyyam. 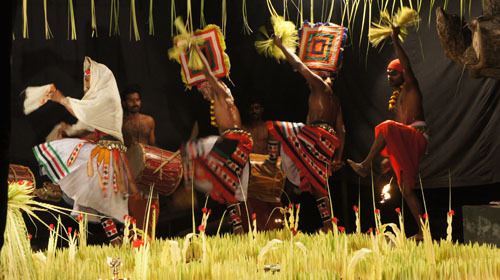 Kalams are a tribal creation but in course of time have been absorbed by people belonging to different castes. 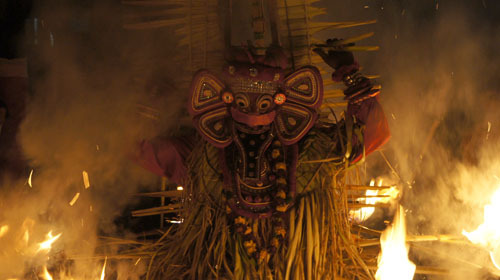 At the end of the ritual, in most of the cases but not always, the Kalam is destroyed by the same officiant or another member of the troupe, fallen in a state of trance. 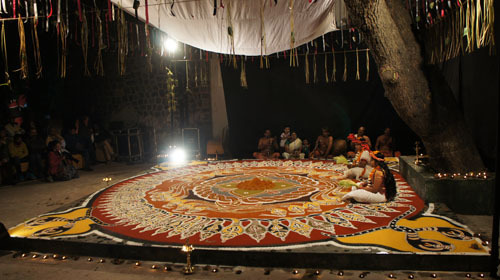 Unfortunately, I could not attend the performance of the first day.